Decking - Is Decking Right For Me? If you are thinking of having a patio area whether it is decking or any other material there are several things to consider. 1 The placement of the decking. 2 Who is going to use it? 3 Raised or leveled? 4 To treat it or not? 5 Are you prepared to do maintenance? 6 All ways ask an expert. Let’s break down these six listed items and look at these one at a time. 1 The placement of the decking. It doesn’t matter what type of material you are going to use for a patio area if it’s in the wrong position. You must look at whether it will be in the sun, shade or exposed to the wind. Even take into consideration the time of the day you are mostly going to use it. What’s the point of having a patio if it is in the shade all the time? Well, when you don’t want to be in direct sunlight. I know some people have ailments that restrict them from being exposed to the sun for any length of time; also some people just prefer to sit in the shade. Another important point is the time of day you are going to use it. Is it going to be throughout the day, just the morning, afternoon or the evening time? It’s no good if you are going to use it in the afternoon and the sun hasn’t reached that area or even passed it so you are in the shade. Can you see now why positioning is so important, so you can fully enjoy the area? 2 Who Is Going To Use It? Now you might be wondering why this is important, let me explain. You might have small children and the area is going to double up as a play area so the surface you decide on has to reflect this. If you have a hard surface they could possibly hurt themselves or decking that is a softer surface but with a chance of splinters? If your children have ride on toys with plastic wheels I can tell you from experience that decking would not be the best surface. Some customers like the patio areas sunk down into the ground so that finished height is flush with ground level. Other customers like to have it raised 4-6inches (100-150mm) above the ground level on bearers. This all comes down to preferences and costs. 4 To Treat The Decking Or Not? Once you have had the decking constructed are you going to have it treated? My recommendation is to treat it with a good quality decking or fence stain. This will preserve the surface for a lot longer and help to keep the look of the product. The decking that you use should already be pressure treated for rot so you can use it as is, the choice is yours. 5 Are You Prepared To Do Maintenance? As with any surface it will weather in time, but as far as decking is concerned you will get a build up of algae. You might not even realise this until you walk on it on a wet day or a moist early morning and end up on your backside. Algae and water just don’t mix as you will end up with a surface that is as slippery as ice, unless you do the maintenance keeping it brushed and cleaned. This again is something to think about. 6 Always Ask An Expert. Why ask an expert as you might have made your own mind up? An experienced person will be able to tell you if you have come up with the right decision or not for your personal circumstances. As you know there are things that can always be overlooked that’s why experienced advice is valuable and could save you time and money. Experienced advice should be free for you to rely on. Hope this helps when you are deciding on what surface you would like even if it’s not decking. Decking – Is Decking Right For Me? If you are thinking of having a patio area whether it is decking or any other material there are several things to consider. 4 To treat it or not? 6 All ways ask an expert. Let’s break down these six listed items and look at these one at a time. 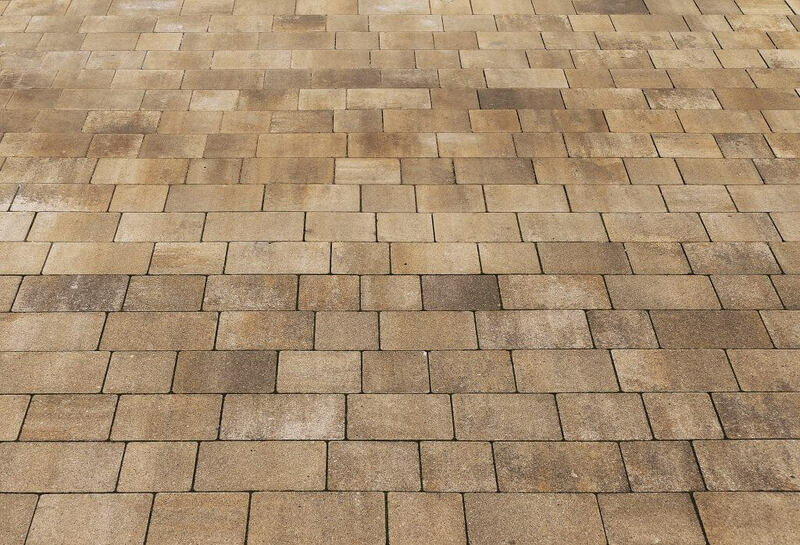 It doesn’t matter what type of material you are going to use for a patio area if it’s in the wrong position. You must look at whether it will be in the sun, shade or exposed to the wind. Even take into consideration the time of the day you are mostly going to use it. What’s the point of having a patio if it is in the shade all the time? Well, when you don’t want to be in direct sunlight. I know some people have ailments that restrict them from being exposed to the sun for any length of time; also some people just prefer to sit in the shade. Another important point is the time of day you are going to use it. Is it going to be throughout the day, just the morning, afternoon or the evening time? It’s no good if you are going to use it in the afternoon and the sun hasn’t reached that area or even passed it so you are in the shade. Can you see now why positioning is so important, so you can fully enjoy the area? Now you might be wondering why this is important, let me explain. You might have small children and the area is going to double up as a play area so the surface you decide on has to reflect this. If you have a hard surface they could possibly hurt themselves or decking that is a softer surface but with a chance of splinters? If your children have ride on toys with plastic wheels I can tell you from experience that decking would not be the best surface. Some customers like the patio areas sunk down into the ground so that finished height is flush with ground level. Other customers like to have it raised 4-6inches (100-150mm) above the ground level on bearers. This all comes down to preferences and costs. 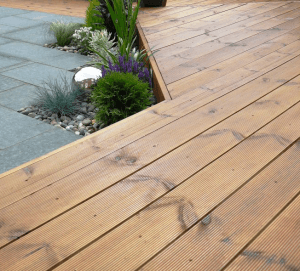 Once you have had the decking constructed are you going to have it treated? My recommendation is to treat it with a good quality decking or fence stain. This will preserve the surface for a lot longer and help to keep the look of the product. The decking that you use should already be pressure treated for rot so you can use it as is, the choice is yours. As with any surface it will weather in time, but as far as decking is concerned you will get a build up of algae. You might not even realise this until you walk on it on a wet day or a moist early morning and end up on your backside. Algae and water just don’t mix as you will end up with a surface that is as slippery as ice, unless you do the maintenance keeping it brushed and cleaned. This again is something to think about. Why ask an expert as you might have made your own mind up? An experienced person will be able to tell you if you have come up with the right decision or not for your personal circumstances. As you know there are things that can always be overlooked that’s why experienced advice is valuable and could save you time and money. Experienced advice should be free for you to rely on. Hope this helps when you are deciding on what surface you would like even if it’s not decking.